Put the eggs in a saucepan, cover with water by 5cm, and put on the stove over medium-high heat. When the water boils, cover, reduce heat to a simmer and put on the timer for 10 minutes. Carefully pour off the hot water, then put the pot in the sink and let cold water run over the eggs until they’re cool enough to peel. Roughly chop the eggs and put them in a bowl. Add the avocado, coriander, chopped chilli, and salt to taste. Refrigerate for 2 hours before serving. To serve, preheat the oven to broil. When the oven’s hot, toast your tortillas by putting them directly on the rack, making sure to flip them to the other side after about a minute. Be sure to watch them carefully so they don’t burn. 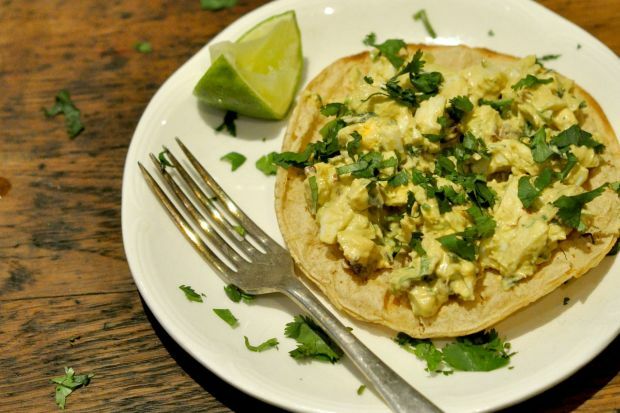 Spoon one-fourth of the egg salad on each of the four tortillas and sprinkle with a little more coriander.